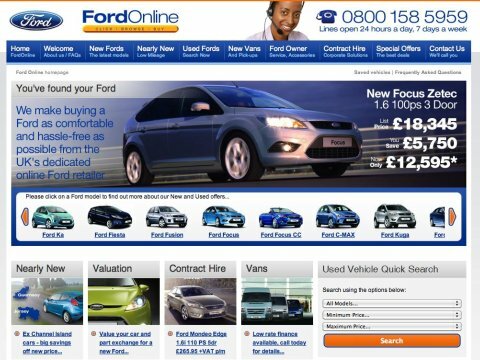 Fordonline.co.uk is a new website from Ford Retail, which has been launched this week based on the belief that people are prepared to buy cars online without a test drive. According to a survey quoted in the press release, 37% of web shoppers would purchase vehicles without taking a test drive, thus removing a barrier to online car buying. This isn’t a full e-commerce offering where users checkout online; instead customers can purchase the vehicle via email or over the telephone, and the car will be delivered to one of 12 regional centres. Still, since most dealer websites only offer a telephone number or the chance to book a test drive, then this new website is a little different. The homepage showcases Ford’s range of new cars, and provides plenty of clear links to the various areas of the site. There is a used car search tool on the page too, which offers a shortcut for users, though it perhaps deserves a more prominent position. Meanwhile, a clear contact number at the top on every page offers both reassurance for customers and a quick point of contact for customers with any questions. I tried the used car search first, and it works well enough, as long as you have a clear idea of the model you want to buy. Other automotive sites have useful car configurator / comparison tools which allow users to enter their preferences and requirements (economy, size etc) before selecting the most suitable fit from the range, and this may have been helpful to the site’s users. Once you have selected a model and price range, the search results page is nice and clear, and contains some useful options to narrow the selection by colour, fuel type, economy etc. Searching for new cars is a different experience, and all you can do is view the details of each model, there is no way to see the range of engine sizes and specifications available, so I’m not sure that enough detail has been provided for customers to make a decision about a car purchase. The product pages for used cars provide a range of photos, as well as the basic details on specifications, mileage etc. Since it is possible to buy or reserve and pick up cars from various collection centres, I think this could be made more clear, and customers should be encouraged to get in touch by phone or email. However, there is just the number at the top of the page, and the contact form at the side. A clearer call to action would be an improvement. In fact, the clearest button on the page allows users to save the car for later in your ‘my garage’ page. Since car buyers will spend time researching online, and visit several sites, this is a useful feature which will allow users to resume their search quickly when they return to the site, but they may not find the ‘my garage’ page as easily as they should. A car purchase is something that customers spend time researching online, so automotive sites need to do as most as possible to provide customers with the information they need to make a decision. While there is some useful information on the site, and the clear contact details and ability to save cars for later viewing, there is still a lot more that this, and most other automotive sites could do to help customers in the research phase. Since user reviews are proven sales drivers, why not have reviews of cars on the website? people will be looking for reviews elsewhere anyway, so why not provide this resource and keep more users on the site. In the same vein, expert reviews by the likes of Parkers and Autocar would be a valuable resource that online car dealers could provide, either through syndication, or simply by linking out to this content. Online video is a great way to showcase most products, has been shown to improve conversion rates, and should work especially well for cars. Many visitors looking at, for instance, a Ford Focus, may then look elsewhere at similar cars from competitors, VW Golfs, Astras, Honda Civics etc. To keep customers on the website, car dealers could provide comparison tools to allow users to compare cars against those from other manufacturers according to fuel economy, price, safety etc. This is something that Jeep, Toyota and other manufacturers do on their US websites. It allows customers to stay on site to do their research, and can increase customer trust if they see that sites are open about comparing against competitors. This new website is well-designed and generally delivers a decent user experience, as well as having a wide range of cars available. Like many other UK automotive websites though, it could make more use of the kind of tools and features that most e-commerce sites have been using for some time; such as product videos and user generated content. One quarter of the government’s websites will be scrapped as part of cost cutting measures which will aim to save the Treasury £100m. A Public Accounts Committee report finds that some central government websites are too expensive, while a third fail to meet the government’s own accessibility standards. One website, for UK Trade and Industry, was found to cost £11.78 per visit. Having been at eTail Europe this week, and it has got me thinking about the different challenges etailers face, many of which should have been solved by now. One of the things I’ve noticed is how seasonality is a key consideration for all retailers. Online marketers are no exception. We all know that sales tend to be stronger in the run up to Christmas and slower throughout the summer months and the overall impact of seasonality will depend on what type of products you are selling, but it will undoubtedly affect all retailers in some way or another. In the article below I will highlight some practical ways that retailers can use paid search marketing techniques, including advice on the use of Google Ad Parameters and the Long Tail, to ensure that the seasonality of the market works in your favour. Private online shopping site Vente-privee released an iPhone app last week which allows users to access the sales from the main website and make purchases via mobile.